National Elections Council (CNE) principal director Jorge Rodriguez has told reporters that a “process of repair” will take place March 18-22 to allow those whose signatures have been rejected, in a campaign to petition a recall referendum against President Hugo Chavez Frias, to re-validate them according to regulations. Rodriguez has met all morning with fellow directors Francisco Carrasquero and Oscar Batagglini. CNE directors Ezequiel Zamora and Sobella Mejia did not attend but their absence was within the letter of the law since their votes would have cancelled each other out. Rodriguez says that “repair locales” will be be open for 10 hours on each of the five days from 6:00 a.m. so that ‘signers’ may review their entries in official records and make any amendments necessary under official inspection. Arrangements are being made for 24 locales at State level, 335 municipalities, 23 parish locales in Caracas and 618 other locales yet to be determined according to data on the number of signatures collected in the original campaign last year. The whole operation will be under the autonomous direction of the CNE which will disperse more than 1,000 officials across the nation. According to Rodriguez, those who attend the designated “repair locales” must show a valid ID card as proof of identity. Public lists will be made available giving the names and ID numbers to each ‘signer’ who is eligible to inspect their original signature and to confirm, repair or deny the entry. The information will also be published on the Internet and in the media. At the end of each day (March 18-22) collected data will be transcribed and encrypted onto CD-ROM and official seals certified by official witnesses and international observers. The CNE guarantees the safety of all those who decide to amend original data in accordance with the law. Published details will include name and ID number of each signatory sorted as to verified signatures, rejected signatures and those that require personal verification. If any signature is rejected it may be amended only by the person directly concerned. Those who are ineligible to exercise voting rights at a General Election and those who are deceased will be precluded from taking part in any “repair” amendment. Rodriguez says that the CNE has conducted a limited study of signatures that have been rejected in the first round and found that of 12,421 signatures 33.7% were rejected as illegible while 23% were rejected because of smudged or fraudulent fingerprints. 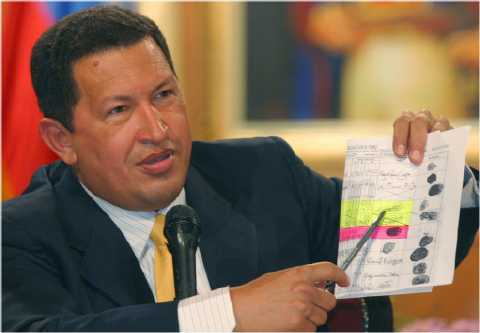 Translated into overall statistics on the signature campaign and the opposition’s claim to have collected 3.4 million, this means that at this time only 1,472,200 signatures have passed muster … well under the constitutionally stipulated 2.4 million to launch a revocatory referendum against President Hugo Chavez Frias. In late breaking news: CNE officials have postponed any announcement on preliminary results until tomorrow, Monday, claiming that there is an overwhelming need to preserve peace after repeated threats by the radical opposition to impose a unilateral decision that would mandate a recall referendum without the constitutionally required number of verified signatures. Diplomatic observers say the fresh delay seems to corroborate unofficial news that the anti-Chavez opposition has NOT been successful in gathering sufficient signatures to launch their petition; and that the CNE fears any announcement tonight would immediately spark a wave of violence. UNOFFICIAL AND UNIDENTIFIED CNE SOURCES quoted by Venezuelan national news organizers seen as allied to the anti-Chavez opposition are saying that the preliminary results which were scheduled to have been announced earlier today would show that the opposition has NOT succeeded in gathering the requisite number of signatures to petition a revocatory recall referendum against President Hugo Chavez Frias as laid out in the 1999 Constitution. 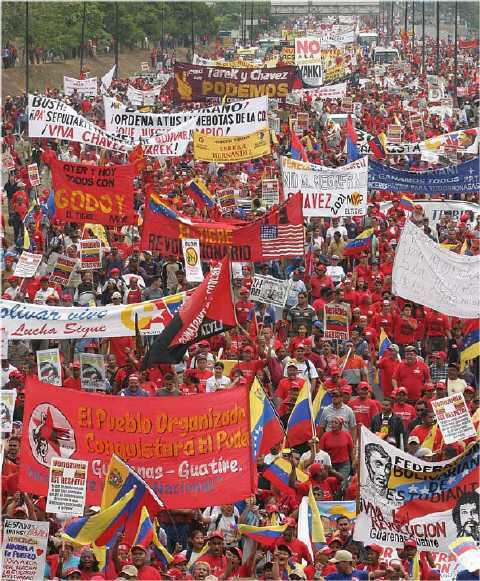 Any formal announcement would put paid to the opposition’s constitutional hope of dislodging President Chavez Frias by anything other than Constitutional means before the next General Election scheduled for December 2005.